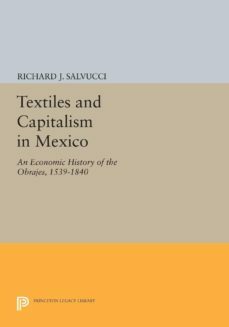 The obrajes, or native textile manufactories, were primary agents of developing capitalism in colonial Mexico. Drawing on previously unknown or unexplored archival sources, Richard Salvucci uses standard economic theory and simple measurement to analyze the obraje and its inability to survive Mexicos integration into the world market after 1790.Originally published in 1988.The Princeton Legacy Library uses the latest print-on-demand technology to again make available previously out-of-print books from the distinguished backlist of Princeton University Press. These paperback editions preserve the original texts of these important books while presenting them in durable paperback editions. The goal of the Princeton Legacy Library is to vastly increase access to the rich scholarly heritage found in the thousands of books published by Princeton University Press since its founding in 1905.